The former oil executive said he would remain at the department until March 31 to conclude an administrative handover, but that Deputy Secretary John Sullivan would take charge. Tillerson did not address reports that he had only learned of his sacking earlier that day when he read about it in Trump’s tweet, but said he had since spoken to the president by telephone. 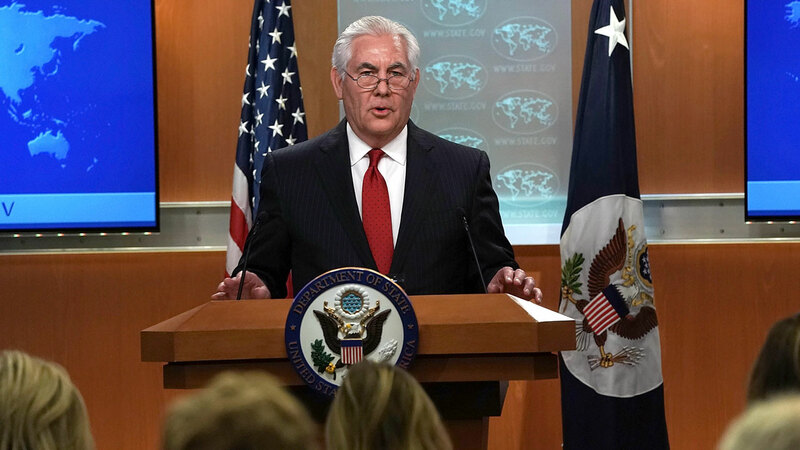 Among his last acts as secretary, as he flew back from Africa late Monday, was to brief reporters on his “outrage” at Russia’s alleged involvement in an attempted assassination using a nerve agent in Britain. In his farewell remarks, he returned to the theme. “Much work remains to respond to the troubling behavior and actions on the part of the Russian government,” he said, before turning to warn Vladimir Putin’s Kremlin not to overstep. “Russia must assess carefully as to how its actions are in the best interests of the Russian people and of the world more broadly. Tillerson’s sacking comes shortly after Trump, without consulting his top diplomat, decided to accept an invitation to talks with North Korea’s Kim Jong-Un on resolving the Korean nuclear stand-off. The departing secretary did not take issue with the decision, but suggested it was made possible by the hard work of his State Department and allies in building sanctions and diplomatic pressure.